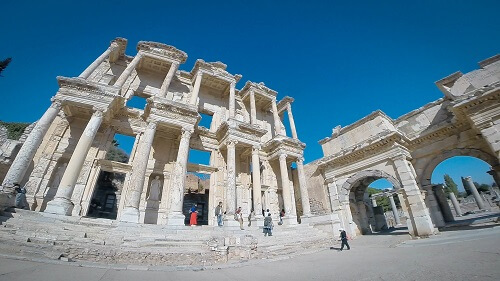 If you are planning your trip to Turkey and visiting the west of this vast country, you for sure put the ancient Ephesus city ruins to your agenda. After all, Ephesus is one of the best known tourist attractions in Turkey. When we visited Ephesus, we realized, why this ancient city attracts so many visitors daily. To make your visit of Ephesus easier and more pleasant, we prepared this short, but practical travel tips. You can find ancient Ephesus city just 3 kilometers from the Selçuk city. Most of the visitors to Ephesus, never bother to stop at the city, but we actually liked it and decided to stay here for the night too. Selçuk is not a very popular place for visitors, but it still has lots of accommodations to choose from – not being touristy, you can find some really cheap ones. If you are not too picky, you can get a double room with private bathroom (hot running water) and local turkish breakfast for as little as 18 EUR/night. Check out some hotels here. If you can afford to spend a bit more, you for sure will not be disappointed over the Urkmez Hotel. The place is nice and not far from the city center. It has free parking and Wi-Fi. The price also includes breakfast. Ancient Ephesus city ruins are spread over a large area, so you can visit it from two different entrances – upper and lower. The best option is to start your sightseeing at the upper entrance and walk slowly down to the lower one. If you are asking yourself how to do this separate entrances when you are traveling around Turkey by a car, there’s a simple solution. The large parking area at the lower entrance (37.94361/027.34213) offers shuttles, which takes you to the upper entrance. Be aware there are two different shuttles available – free and payable. If you decide for a free one, it is not bad, but it will stop on the road for visiting a leather shop. 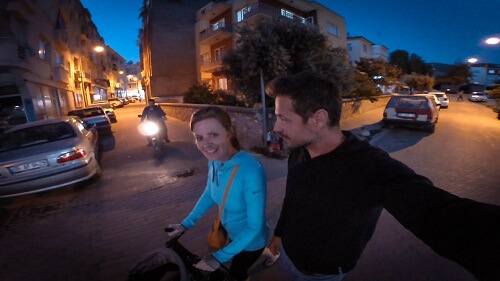 Some have this for a tourist scam, but traveling around Turkey a lot, this is a common practice, also when you pay for the ride. Nevertheless, no one will force you to actually go inside the shop – we were the only one on the shuttle, so we did not even go off. After a minute of two, the driver closed the doors (not happily), but we continued our way to the entrance and it still was free of charge. Ephesus is a large area without any shade, so bring a sunscreen and a hat to protect you against the sun. Don’t even forget a snack and lots of water, as inside of the Ephesus there are no shops available. If you are bringing a baby stroller, the first part at the upper entrance is a bit rough, as the road is still the ancient one, using stones for cobbling. But we managed to use it anyway. There are also few steps along the way, so prepare for some lifting. If you are having a stroller, you won’t be able to entrance to the terraces houses with it. 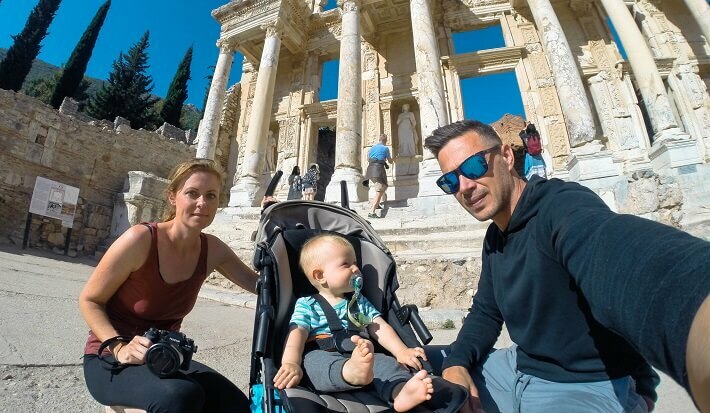 But in general, having a baby stroller should be OK.
To see the Ephesus, there’s a fee (40 TL/adult*) and additional fee for the terrace houses (20 TL/adult*). I really enjoy history, so I did want to see them and honestly I loved them more than the more known Celsius library. Apart from the terrace houses and Celsius library, there’s another great sight in Ephesus – the temple of Artemis and amphitheater, which could hold up to 25.000 people. Amazing! *Ticket prices are from September 2017. What else can you see in Selçuk? Even though Selçuk is not visited by many tourists, there are still sights worth your attention. If you are keen on history, you will for sure enjoy your time stopping at the Ephesus museum, basilica of St. John, Meryemana – the Virgin Mary’s House, Ayasuluk fort, which offers great views over the city. Just 8 kilometers far from the city, you can also find a small Greek village Şirince. If you’re not thrilled over history, you can also spend a full day on the city’s beach Pamucak – just 7 kilometers from Selçuk. 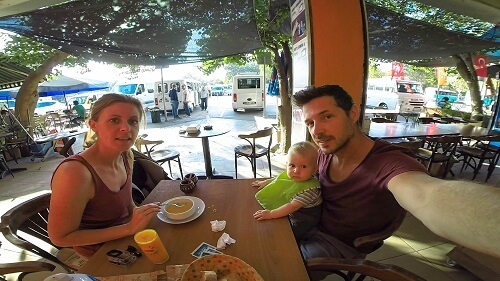 The city of Selçuk has many restaurants, but the best offer can be find at the main bus station in the middle of the town. The food is fresh, good and affordable too. Visiting the city of Selçuk might not sound too attractive at first, but if you ask me, that’s the exact reason to stop here and explore it. 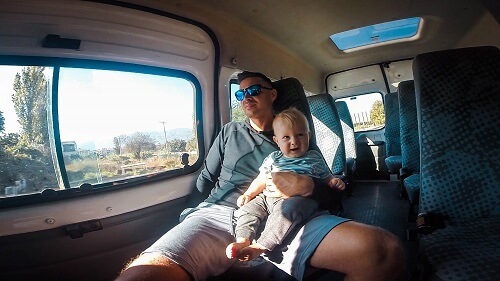 Being visited by only few tourists makes the city local and authentic, what for sure is the number one thing for which travelers should stop there.